In this solo dining adventure, Gary finds some really good pizza in San Francisco at North Beach’s Tony’s Pizza Napoletana. I love pizza. In high school, pizza was my favorite food to eat and I would look forward to getting a slice after school most days. A slice of pizza was the perfect after-school snack – not too filling so I’d be unable to eat dinner later and not too expensive so I wouldn’t break my meager wallet. As a nearly life-long New Yorker, I’ve run the gamut as far as pizza goes – cheap pizza by the slice, expensive pizza by the slice, old-fashioned coal oven pizzas, and new school Neopolitan-style pizzas. Such exposure over the years to all the wonderful pizza my home city has to offer has turned me into something of a pizza snob (shocking, I know). It’s not that I’m dismissive of other cities’ attempts at pizza, I just don’t believe they can ever hold a candle to New York City. Still, that doesn’t mean I’m not willing to keep searching for a pizza that’s equal to or even superior to that of my home town. So when JP suggested pizza on our last night in San Francisco, I kept an open mind with regards to his choice of pizzerias – Tony’s Pizza Napoletana. 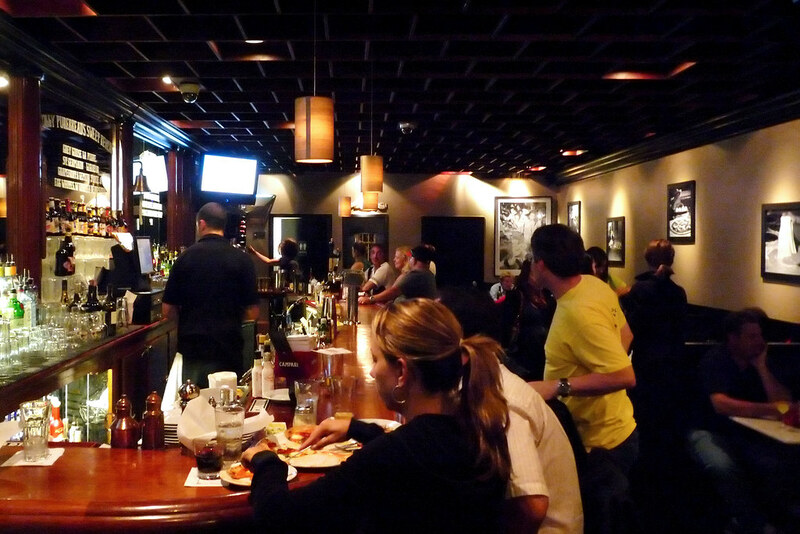 If arriving a little after 8 pm on a Sunday night only to be told it’d be at an hour-long wait for a table was any indication, it seemed like a popular spot and you can’t be popular without being good, right? When we were finally seated a little before 9 pm, I was optimistic, having seen the delicious looking food at the bar and tables near us. 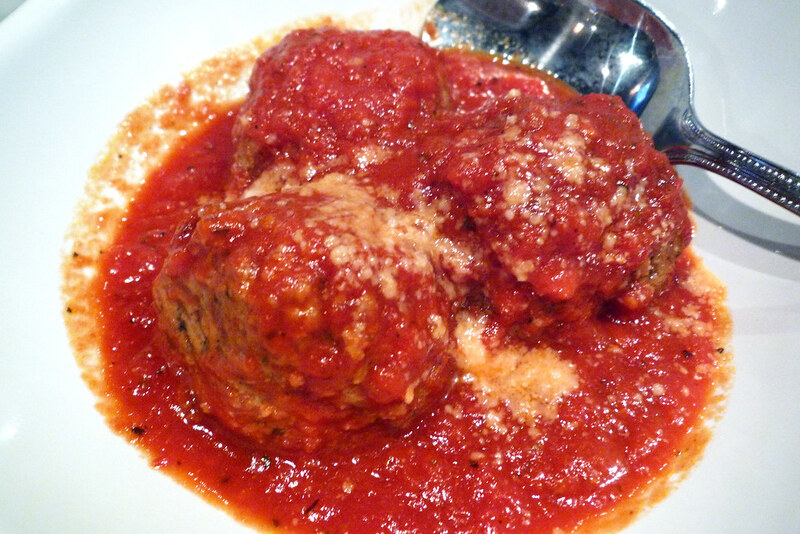 Before we got to the pizza, we started with an order of meatballs. They were very good with the meat soft but not mushy and the right amount of seasoning. The sauce was nice too, especially for dipping the complimentary bread into. Next up before our pizza was a very nice spinach salad. 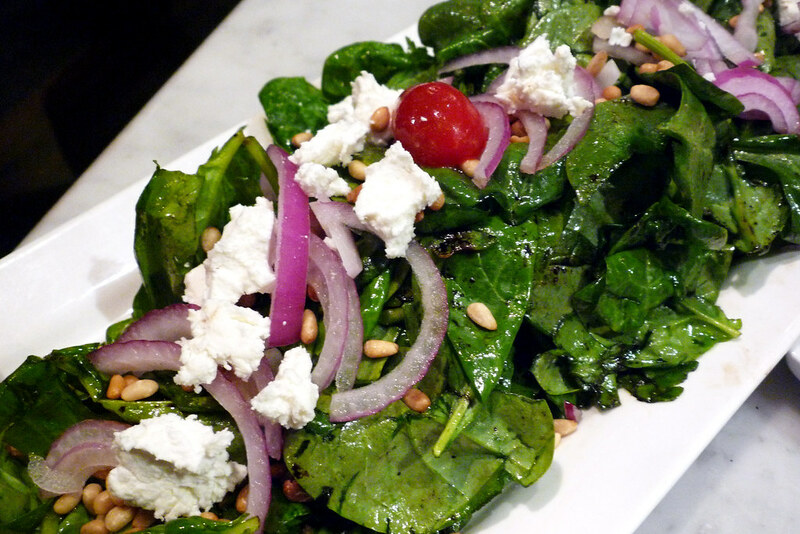 A good sized portion of spinach dotted with goat cheese, pine nuts, red onion, balsamic reduction, and olive oil – this was the perfect pre-pizza starter. 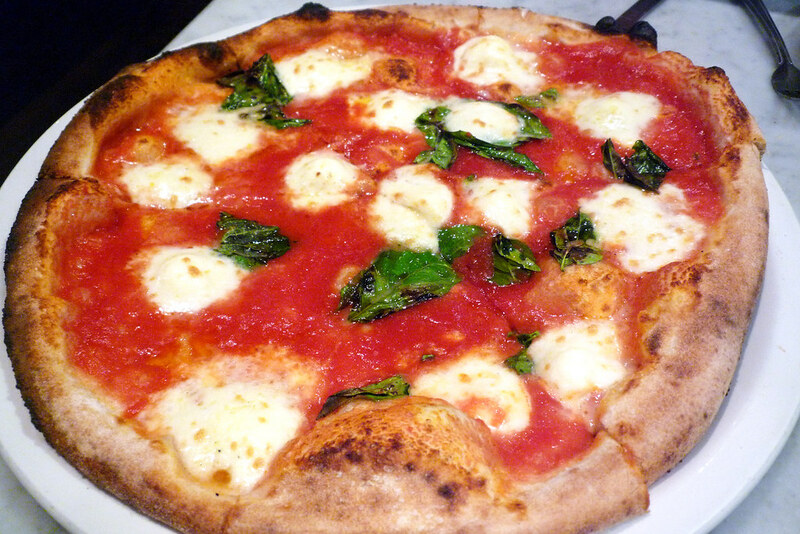 Finally, we get to the their famous award-winning margherita. Limited to only 73 made a day for whatever reason, we didn’t expect to be able to order it at the tail-end of the day but, lo and behold, it was still available. For a pizza that won the 2007 World Pizza Cup in Naples, you’d think they’d go through all 73 by their ninth hour of service, wouldn’t you? Wisecracks about their limited availability (or rather their inability to go through it) aside, Tony’s makes a really good margherita. Quality ingredients never hurt and their margherita has it in spades – really delicious, fresh mozzarella, slightly sweet San Marzano tomatoes, and high-quality extra virgin olive oil. The crust was thin and crisp and just salty enough to balance out the sauce’s sweetness. In short, this was a great pizza. I’ll end any suspense you may have left – Tony’s Pizza Napoletana was quite possibly the best pizza I’ve ever had outside of New York City. I don’t think it’s as good as the one at Motorino but the margherita here is top-notch. For $19, it better be, no? The service here is solid, constantly checking in on us and refilling our water glasses which was necessary the night we were there because it was really hot in the dining area. That’s the only knock on the place – a conservative approach to air-conditioning that left me sweating throughout the meal. But it’s a good meal to be sweating through so it was worth it. Tony’s Pizza Napoletana. 1570 Stockton Street, San Francisco, CA 94133. [Show/Hide Map] (415) 835-9888.